Gallup recently released its 2017 findings from their seminal work on employee engagement in the American workplace. Once again, the percentage of employees who report being “engaged” is 33%. This number is disappointing and has barely changed over the past decade. Must we simply resign ourselves to the fact that a vast majority of employees will show up to work every day being disengaged? NO! There is another way! We believe that engagement in the workplace can be improved and that there is a level of performance BEYOND engagement; that employees yearn for a work environment that creates the conditions encourages them to show up at their best. Fulfillment at work doesn’t need to be so rare. And it’s not rocket surgery (nod to Brett Kleffner). Think of a time in your life when you were at your best… when your heart was fully in it, and your performance reflected your passion. List the conditions that created or accompanied that performance. 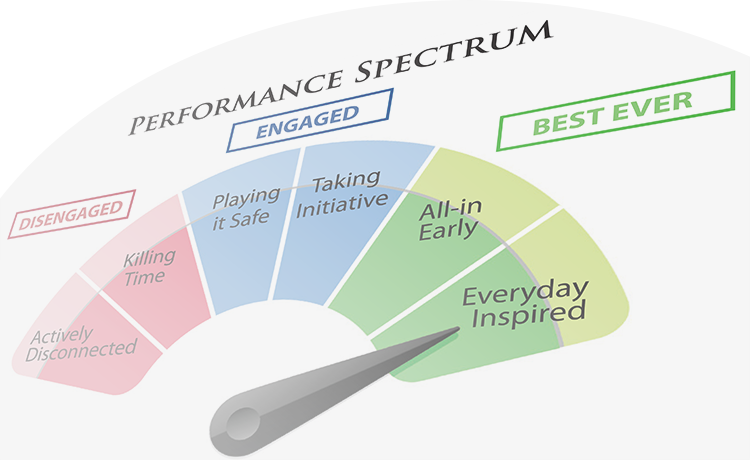 Now start creating those conditions at work… they will give others a greater opportunity to become more fully engaged and even reach that level of performance that goes beyond engagement. When we create a workplace that fosters inspiration, encourages the inspired, and recognizes employees who are all in, we’ll see these changes reflected in the numbers. When we’re inspired, we become inspiring… and that’s a lot better than engaged.